Is the Gaokao Doing its Best to Help Education in China? As a Peace Corps volunteer in rural, northwest China, I taught English at a university that was known for having low-level students. In my first writing class, I had the students warm up by free writing for five minutes about a given topic. One of the topics was “their biggest regret.” All but one of the students in my 30-student class revealed that not studying harder for the gaokao, the Chinese college entrance exam, and getting into such a terrible university was the thing they regretted most. Was this really their fault though? Like most other countries, China struggles with some form of inequality. Ask your traveling Chinese friends where they are from. It’s probably somewhere you’ve heard of, Beijing or Shanghai. Most of my students have never left their province. They would never dream of asking their parents for that much money. And also like most other countries, this inequality can be heavily reflected in the education system. In China, education is compulsory until the 9th grade. Then students can decide to test into senior high school to prepare for college. Starting around age 12, children in China begin to spend most of their time at school. They study from the early morning hours to very late in the evening with small breaks for lunch and dinner. Most of them spend this part of their life studying for the infamous gaokao. This exam is administered once a year and takes place over 2-3 days. Students are tested in Chinese, Mathematics and a foreign language. They also have to option of taking a science or an art section. If the student does not like his or her score, they have the option of repeating their senior year and then the exam. Before the gaokao students choose three universities, based on their anticipated results, to receive their scores. The last one or two are usually safety schools. The student will know which university they will attend once they receive their scores as each university has a cut-off score. In theory, it is the only thing a university looks at when considering a potential student and it will eliminate the inequality when they select students. The results of this exam will dictate their future. Many of my students talked to me about their last year of senior high school, just before college. They spent the entire year studying only for the exam, in class and out, yet they still felt they did poorly. 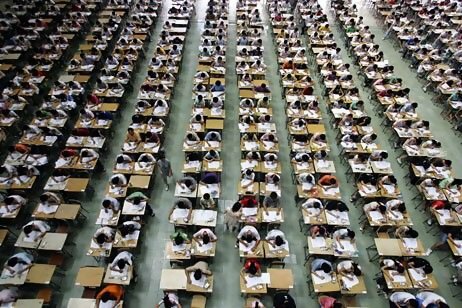 This article from the New York Times article tells the stories of a few individuals around their time of the exam, as does BBC’s video Gaokao Fever. Close to 10 million students take the gaokao each year, and of those, around 75% are admitted into colleges. This is pretty high considering it is the only thing that will admit them to school. There is a huge drop-out after compulsory middle school. Some provinces estimate up to 40% of their students do not continue with their education after grade 9. The gaokao not only determines the student’s school, but also their major, which depends on their scores in each section. Once a major has been given, it is very difficult to change and happened to only two or three of the 500+ English majors I taught. This may be changing though, and varied throughout the country. In a conversation with a college English teacher from another area of China, she said, “My school has given students more freedom to [change majors]. Nearly everyone can in the first college year, but only a small portion of students have done that. I don’t know if it is because it’s a common practice in universities now or just because we have a new school president who’s very liberal.” I think what’s most interesting about this is the students do not wish to change their major. This may indicate that the gaokao is doing what it is supposed to do, putting students in majors that fit them best, at least with this particular university. It’s hard to say whether creative thinking or accumulation of facts is the better education philosophy when most of us have only grown up with one or the other, but even the policy makers in China are starting to change their idea as the economy grows and they face the challenge of keeping up with the rest of the world. Is that because the west has the money and power? Or do the Chinese really see a need for change? If the universities do begin to diversify their selection process, guanxi, the very cultural relationship factor, may very well impede the harder working students. The gaokao is designed for equity. If the policy makers open the college application process up to resumes and interviews, it may be much easier for families with power and money to pull strings and get their children into top universities. If a new “quality education” does make its way out of these policy reforms, what will the system look like? And how long will it take? ← Nevada: A Case Study in Crisis? Aftan, thank you for your post. To me, it is unfortunate that 1 test decides future life of a student. I think rich students benefit from private tutoring. Have you found some information in regards to private tutoring for gaokao in China? Given your comment regarding the traveling Chinese friends from Biejing and the current disparities between students in large cities versus the regions, I would question what is the real state of equality in the present school system now. The assessing of he exams may be equal, but the process of preparation seems anything but. Along the lines of Ms. Mun’s comment, does equality exist when students who can afford private tutoring have a better opportunity than those who can’t? Aftan you have done a lot of work in Gaokao issue. I was surprised when I see only one of your students said the thing he or she regrets is not Gaokao. You must have the experience of the huge population of China and this is the reason for the maintenance of this education policy since we have no other more equal choice.